In the Nordic countries, we register several traits that make us unique. These traits describe health and welfare of the calf and cow. Nordic dairy farmers have been breeding towards better health and functionality in dairy cows since the 1980s. The challenge with many health traits is that registrations are difficult to measure objectively like milk yield and conformation. In the Nordic countries, we rely on registrations from veterinarians that are obliged by law to report diseases and treatments. This means that we have health records for 90 % of the dairy cows in active dairy herds. Much effort has been done in relation to standardizing the definition and recording of diseases. For health diagnosis, strict rules are applied, and only data from herds that comply within these rules are used in the estimation of breeding values. Claw trimmer data is the newest source of health data. Nordic countries have developed and implemented an efficient digital registration system. It has been positively received by farmers, claw trimmers and advisors leading to a high registration level. 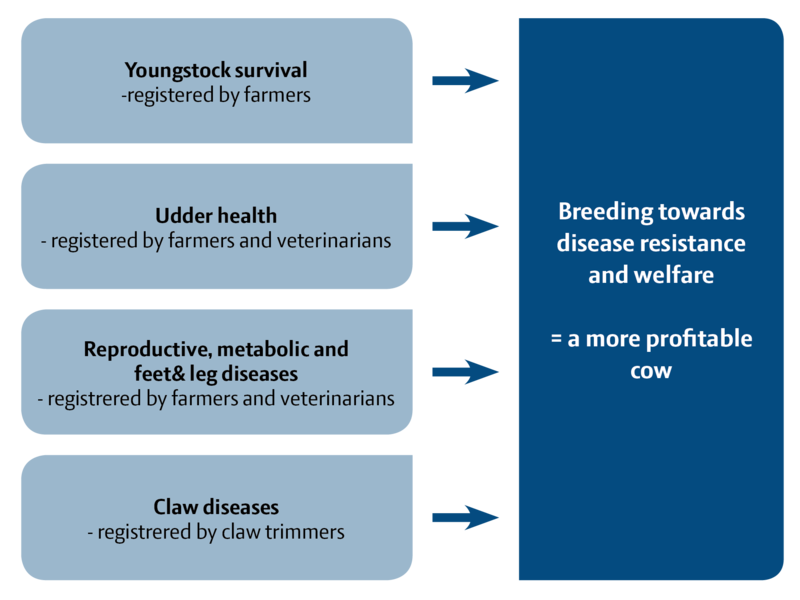 After development of the system for claw health, registrations on more than 190,000 cows are received every year. This means that reliabilities on the breeding values are high, and claw health in the Nordic countries has greatly improved. Get more profit from healthy cows - rely on our unique Nordic Health traits in the Nordic Total Merit - NTM.